This man is a true hero. He put his life on the line to save a dog that was stuck in a rather dangerous position, and managed to get himself and the dog out without anyone being hurt! Sayano–Shushenskaya Dam: In 1998, the Russian Emergency Situations Ministry claimed that the "station construction [had] dangerously changed" and that the dam wall might not withstand the repeatedly increasing pressures of the annual spring floods. Since the basement of the dam is weakened, the 30 million tons of water pressure is currently not divided 40/60 between the dam as arc supporting on the shore rocks and dam with its own weight. Most of the water pressure (and probably some from the dam's own weight too) is today driven to the shore rocks since the dam is not constructed to withstand such pressure division. There were problems with increasing water filtration through dam concrete also. In 1993 a French company "Saltenbash" impregnated dam constructions with resins after which the filtration was reduced and situation improved substantially. In later times the impregnation was repeated by Russian companies. 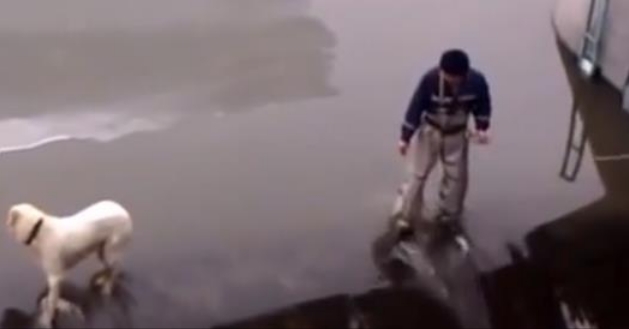 Responses to "Man Risks Life and Limb to Rescue Dog Stuck on Edge of Dam"